1972. 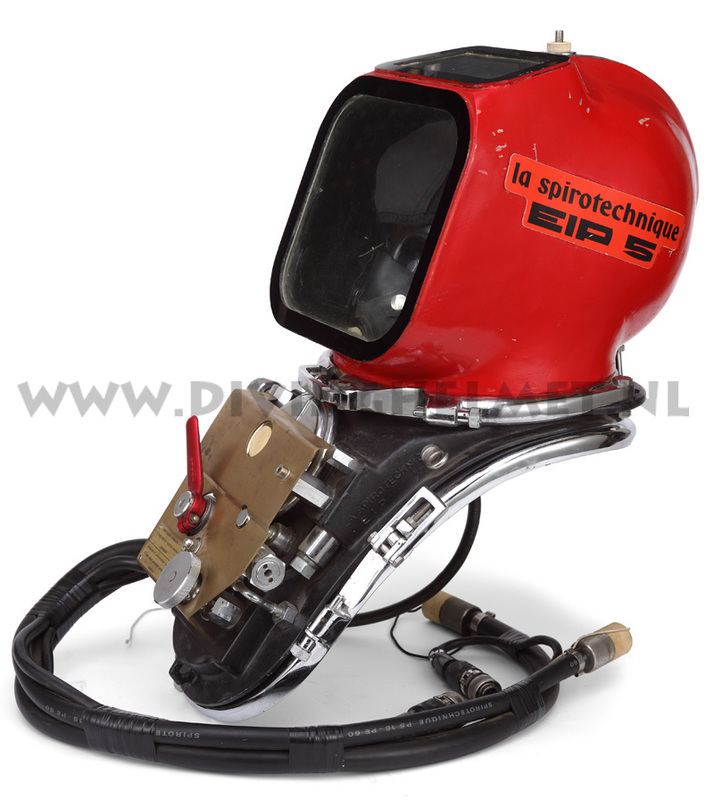 The La Spirotechnique E.I.P.5 diving helmet. First tests of ‘saturation diving’ are done in 1938 in the USA when Max Nohl and Edgar End stay for 27 hours at a depth of 101 feet breathing air. The effect of staying under pressure for such a long period of time is that your tissues get saturated with the maximum partial pressure of gas possible at the depth you stay. Nohl and End just stayed there for 27 hours but once the tissues are saturated you could stay ‘as long as you want’ at the depth without further increasing the time for decompression when returning to surface. This decompression when returning to the surface is the risky part of the divers job: then he has the risk of decompression sickness. Since the tests performed by Nohl and End, saturation diving systems have been developed for divers to stay under pressure for a longer period of time, working shifts in the water and resting in a chamber which is pressurized to the same pressure as the divers working depth. 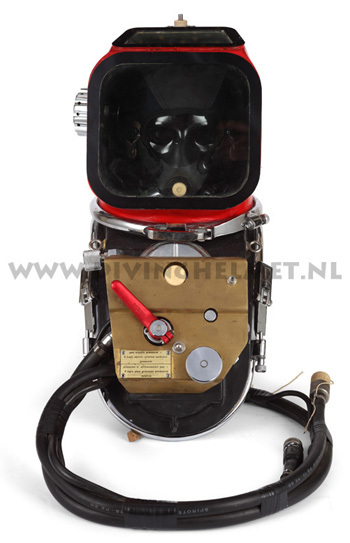 Nowadays saturation diving is not only done for the real deep diving work, also the ( shallower ) North Sea diving work is performed by saturation divers. In 1972 a deep diving system designed by La Spirotechnique is introduced. The system is basically identical to the saturation diving systems still used today: a team of divers lives in a pressurized chamber on board of a ship. When its time to ‘go to work’ 2 divers and a ‘bell man’ enter a bell which is connected to the chamber to be lowered down to the sea bed. The 2 divers leave the bell and go to work, the bell man stays in contact with both the surface and the divers from inside the bell. After the shift has ended the divers return to the bell and are brought back to the surface where the divers return to the chamber. In the chamber the pressure is equal to the pressure at the working depth on the sea bed. There are usually 3 groups of divers working in 8 hour shifts ( which adds up to 24 hours per day ) and that 7 days a week. These groups of divers usually stay ‘down’ for 3 weeks and then use the fourth week for decompression, the last 2 days of decompression they are allowed to leave the chamber but must stay on board under medical supervision. The advantage is that the work goes on for 24 hours a day, 7 days a week and no time is lost with the risky decompression after each shift. 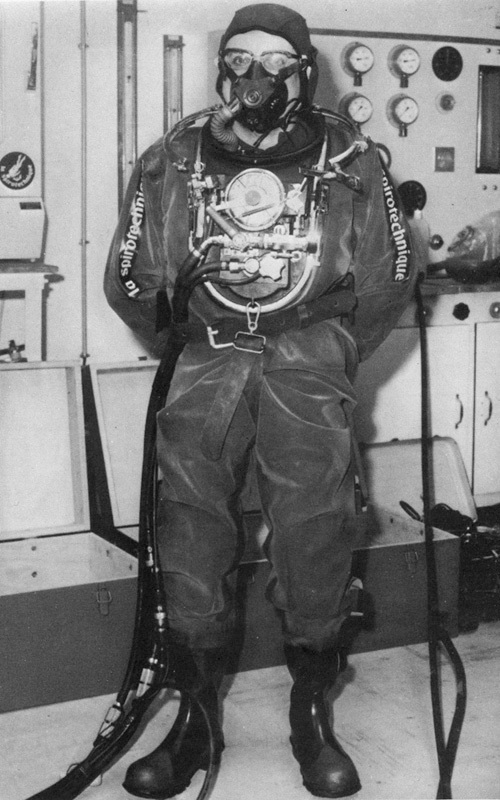 In September 1972 the new La Spirotechnique deep diving equipment is tested at the ‘Centre de physiologie hyperbare’ of the C.E.M.A. ( Centre d’Etudes Marines Avancées ) in France. The system uses a ‘return-line’ which means that the divers breathing gas ( a mixture of helium and oxygen ) after being exhaled is not exhausted from the helmet into the water like with the common free flow air helmets, but returned to the bell instead where the CO2 is filtered out and is enriched by adding fresh oxygen. After being ‘cleaned’ and having restored the oxygen level the breathing gas is then pumped back to the diver etc. The main reason for this ‘recirculating’ of the breathing gas is that the helium gas which is used as an inert gas with the oxygen is extremely expensive and a lot of it is needed when diving deep. Breathing normal air under pressure is dangerous because the oxygen and nitrogen become toxic at certain depths ( under pressure ) The oxygen is needed for the diver to breathe but it may not exceed a certain level depending on the exact depth the diver is working. By replacing the 78% nitrogen and 1% other gasses in the normal air by helium and controlling the oxygen level a breathing gas is created for deep diving. But when diving at a depth of for instance 300 meters, a diver respires ‘compressed’ breathing gas. This means that when he needs for instance 20 liters per minute at the surface he needs 31 times that volume when he is working at 300 meters ( at a depth of 300 meters the pressure is 31 atmosphere ) which would add up to 620 liters per minute. At 0,05 cents per liter of helium this would cost somewhere between a thousand and fifteen hundred euro per hour, per diver, assuming that the quantities of Helium needed for the team of divers for a month can be stored on board of the vessel. By recirculating the breathing gas the loss of helium is brought back to a minimum and these problems are put aside. The system is called the E.I.P.5 ( Équipement Intégré Professionel / Integrated Deep Diving Equipment ) It enables interventions of saturation dives to be carried out under extreme conditions: depth 300 meters, water temperature -2 centigrade. The EIP5 helmet itself is an impressive looking piece of equipment where the diver wears an aviation style cap with communications and an oxygen mask inside the helmet, the regulator system is built onto the breastplate which is extremely big and made out of moulded aluminium. Onto the breastplate are built: a manually operated 1/4 turn open-close valve for gas return. 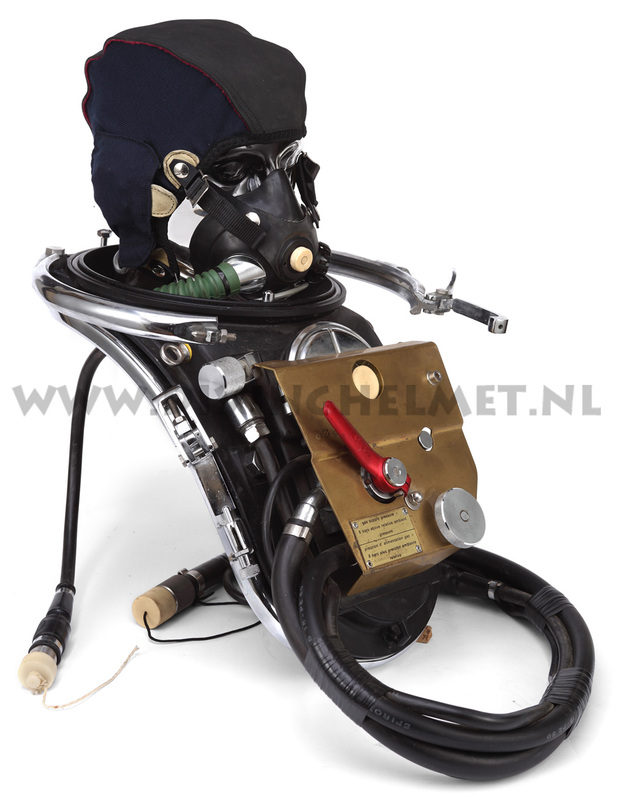 A free flow valve of the breathing regulator, a suit inflation button, a suit deflation lever ( partial deflation ) And a de-misting valve for the helmet ports. The most common EIP helmet is the EIP5 but even though I found no evidence there probably also once was an EIP1 helmet, followed by an EIP2 and 3. The first EIP which I found a picture off was marked EIP4. Some research learned that there are ( at least ) 5 different versions of the final EIP5 helmet: the first version which is used in 1972. This helmet has a small round faceplate which can be taken off the helmet by unlocking a clamp ring, and the breastplate has a cover which is shaped after the equipment underneath which it is protecting. The second version has the same round faceplate which can be taken off with the clamp ring but the cover on the breastplate has been replaced by a flat metal plate. The third version has the same helmet but the valves mechanism at the breastplate is of a different design. The fourth version has the same flat cover at the breastplate as the second but the round faceplate has been replaced by a larger square one which is built into the mainframe and can not be taken off. The fifth and ( probably ) final version also has the large square faceplate but now both windows have a chromed frame around it. Documentation on these helmets and equipment is rare, the earliest documentation I have in my library explains about the tests in 1972, the youngest documentation shows the helmet with the square faceplate is dated 1978. The fact that in 1982 the hot water suit was developed for it, means that this system was also used in the nineteen eighties, maybe still in the nineteen nineties. The photograph above shows an EIP4 helmet. When comparing the helmet with the EIP5‘s shown here below you can see that the main difference between the EIP4 and the first 2 versions of the EIP5 is the breastplate. Maybe that this version has the demand valve on the inside of the breastplate(?) Also it appears to have 2 pulling cords over the shoulder(?) Anyone having more information about the EIP4 or earlier versions of this helmet is invited to contribute to this article. Photograph: scanned from the french magazine ‘L’avonture Sous-Marine’ No 90 of 1972. Magazine David L.Dekker collection. The photograph above shows the first version of the EIP5 helmet. The breastplate seems to be of a completely different layout. The 2 valve knobs have been replaced by 1 handle and 1 knob, the pulling cords have disappeared and also does the breastplate now have a cover over the valves. Photograph: scanned from the french magazine ‘L’avonture Sous-Marine’ No 91 of 1972. Magazine Dominique Breheret collection. The photograph above shows a later version of the EIP5 helmet. The helmet was offered to me several years ago by a man from Romania. Unfortunately this helmet is incomplete, the cover of the breastplate is missing making it difficult to know which variation this helmet is. The photograph above shows a version of the EIP5 helmet with a different valve system on the breastplate. Now it has the red lever and the 2 valve knobs. 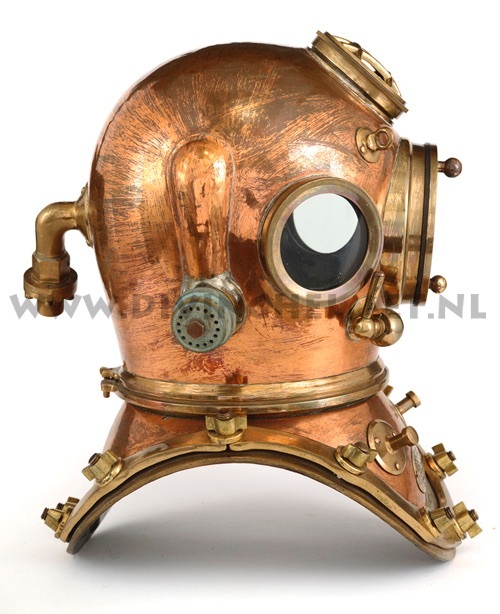 The bonnet has been removed and breastplate has no cover which seems to be done to allow the photographer to take a picture of the divers oral nasal mask and the valves at the breastplate underneath the cover. Photograph: scanned from the french magazine ‘L’avonture Sous-Marine’ No 101 of 1974. Magazine David L.Dekker collection. 197?. 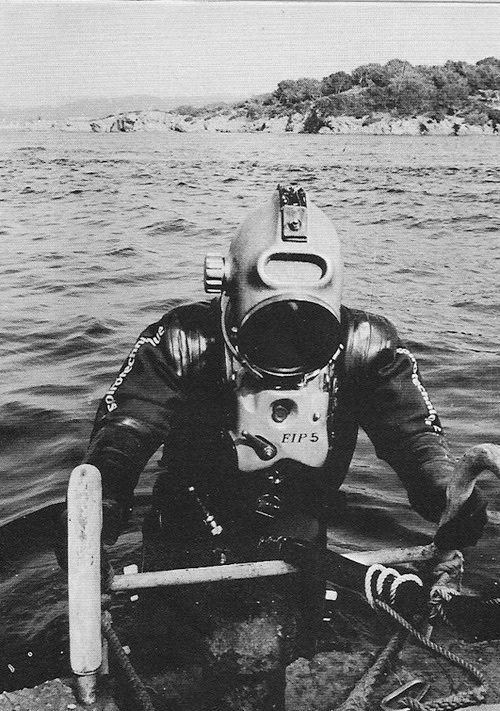 The La Spirotechnique E.I.P.4 diving helmet. 1972. 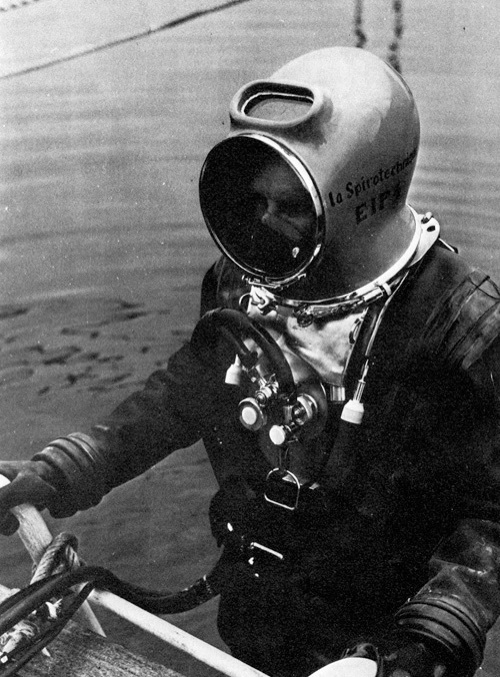 The La Spirotechnique EIP-5 diving helmet, first variation. 1974. 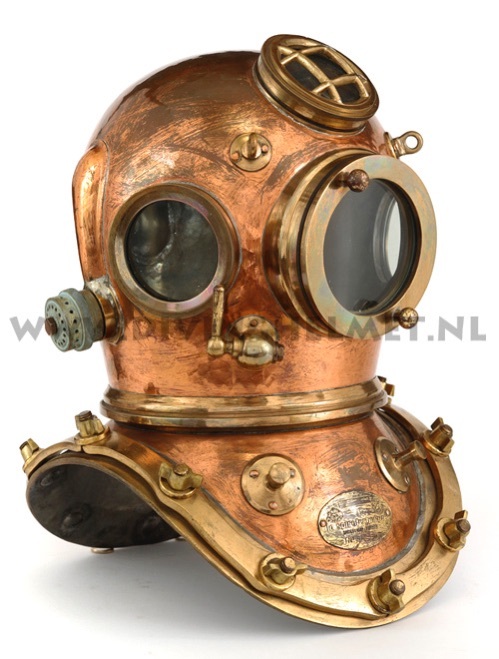 The La Spirotechnique EIP-5 diving helmet, third variation. 1974. 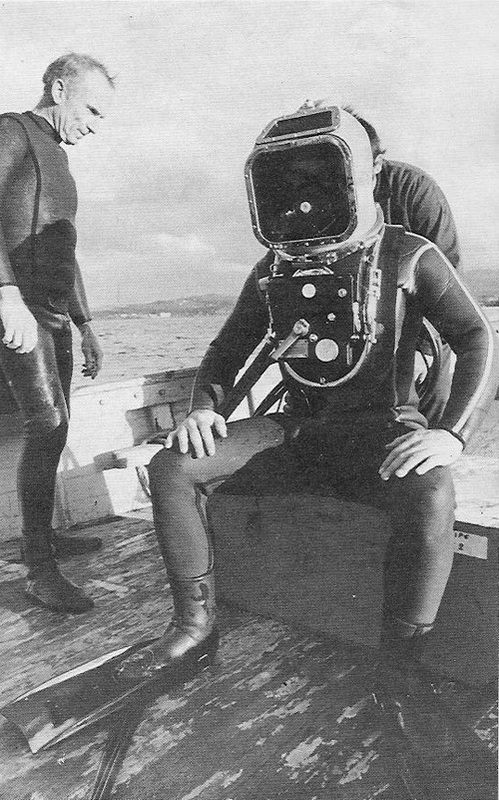 The La Spirotechnique EIP-5 diving helmet, second variation. 1978. 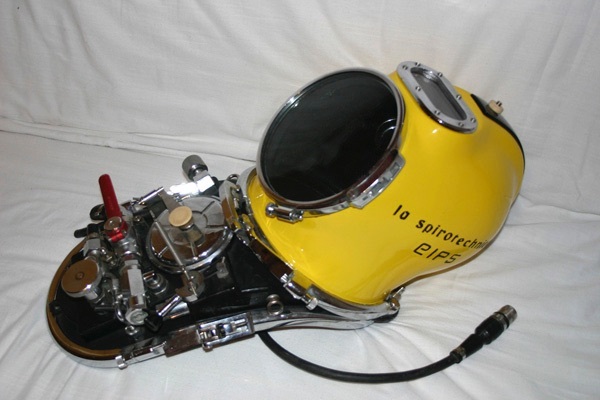 The La Spirotechnique EIP-5 diving helmet, fourth variation. 1978. 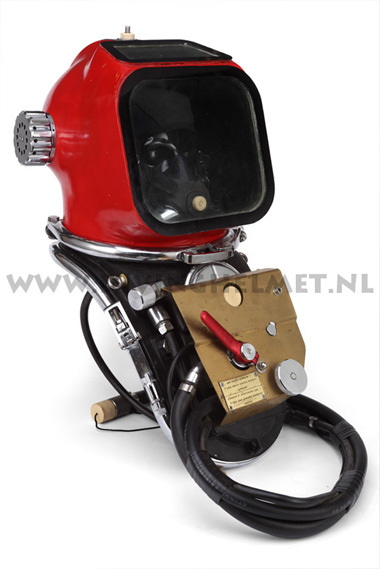 The La Spirotechnique EIP-5 diving helmet, fifth variation. The photographs above show the second version of the EIP5 helmet with a square faceplate. At this helmet the large square faceplate now has chromed frames around the windows. I assume that this is the last and final version of the EIP5 helmet. Interesting detail: the breastplate is fitted with an adaptor bag which covers the inside of the breastplate and has a neck seal so the diver can wear a standard wetsuit. Photograph: scanned from the french magazine ‘L’avonture Sous-Marine’. 19??. 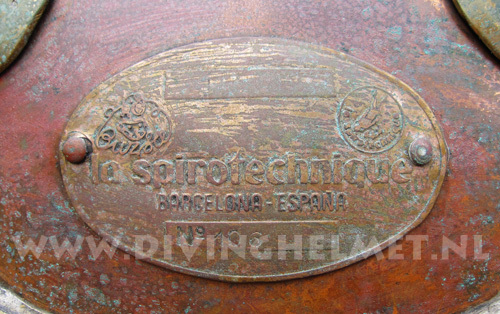 The ‘La Spirotechnique Barcelona’ Diving Helmet. Questions? Suggestions? 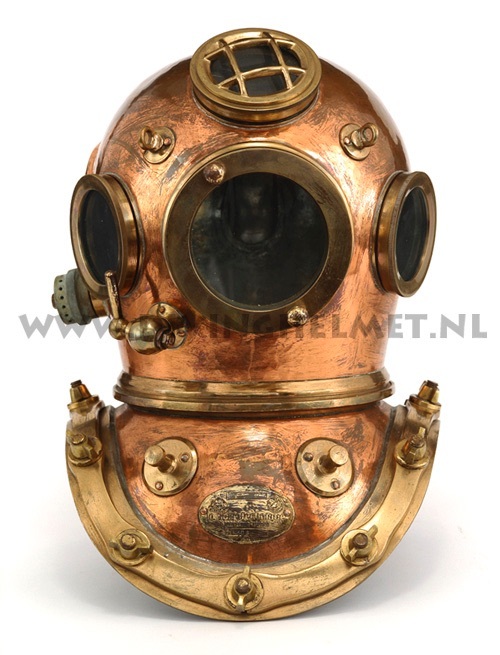 Diving Equipment or Documentation for sale?